Norton has big pillow pet knock-offs on his floor in his room. He’s got a monkey and a giraffe, plus we’ve got an elephant that we bought before Norton was even thought of. We bought the elephant for the puppies to use as a dog bed. For a few minutes, Norton and I wrestled and rolled around on the animals… and then the short attention span that is trademark to toddlers set in. We left the nursery and came out to the living room while I tried to figure out something else for our toddler play adventure. 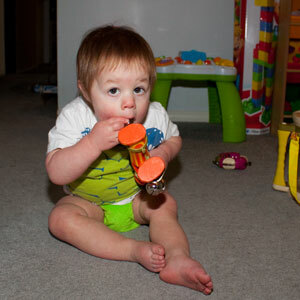 I bought Norton a toy percussion set by B. Toys (the B. Parum Pum Drum) for Christmas last year. It said 18 months, but I had friends online who played with the same toys with their children. Those children were about the same age as Norton (9 months at the time), so I bought it and put away the little maraca eggs that were choking hazards. Still, he was never interested. Until now. For twenty minutes, Norton and I played with that percussion set. Sometimes he would shake the little egg maracas. Sometimes he’d play with the caterpillar tambourine or the ants in his pants bells. (Or, you know, eat them.) He’d use the drum sticks on the little drum. Sometimes, he’d decide to incorporate the Leap Frog Learn & Groove Musical Table he got for Christmas last year in the game. He’d push something on the table so that he could dance to the music. All in all, it was good fun. We may not have done the challenge as intended, but considering the whole point of the challenge is to just get down there and play, we made something that worked for us. To me, that’s a victory in toddler play. We’ll take it. That IS a victory in toddler play! I know its hard to do some of these with a toddler or even for those that are younger. 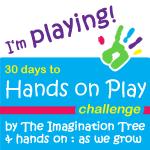 But I’m glad to see that everyone’s understanding that this is more about just playing, intentionally and fully, with your child.